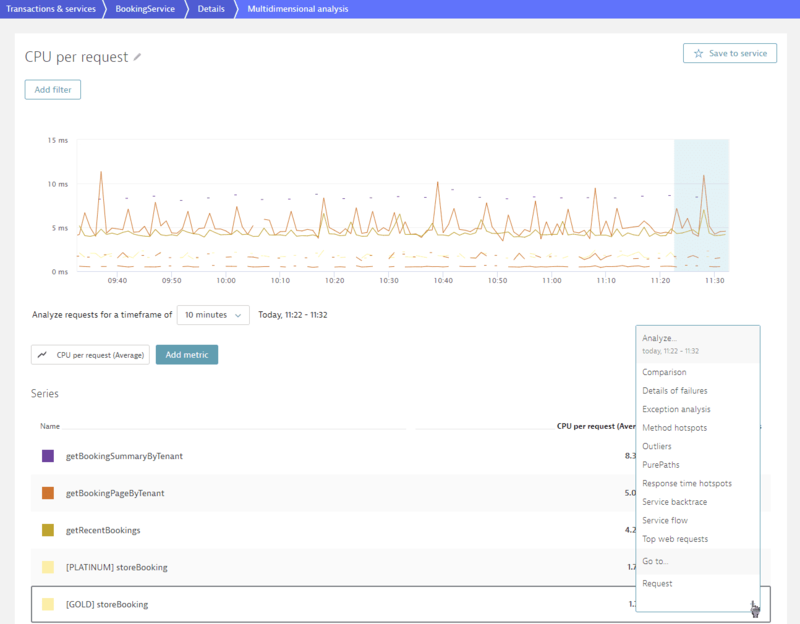 Context-specific drill-down menus simplify navigation and filtering of results presented on Dynatrace service-analysis views. You can quickly slice through vast amounts of data in just a few clicks. Context-specific filters are available on nearly all service analysis pages that feature table-based layouts. Clicking the filter button of a specific service instance in the service instance table filters the entire page to show only the results of that specific service instance. Have a look at the example service Details page below. 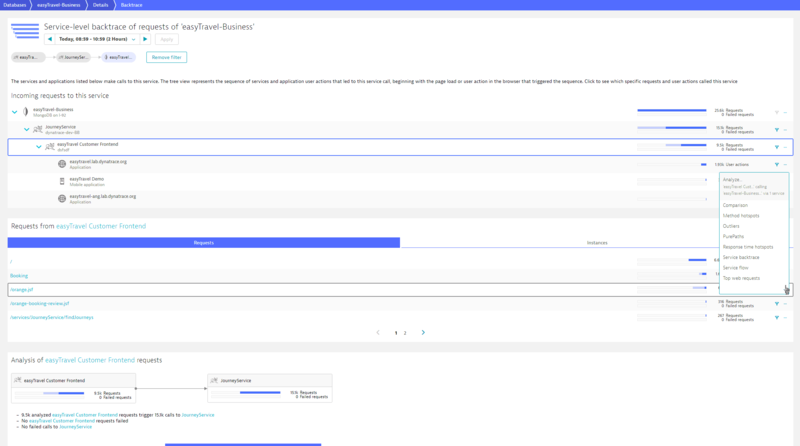 Clicking the filter button of a specific service instance in the service instance table will filter the entire page to show only the results of that specific service instance. Similarly, clicking the filter button of a specific request attribute on the Request attributes tab filters the entire page to show only those results that relate to the selected request attribute. The Analyze menus, available for results on all table-based service analysis pages, reveal all possible drill downs and analysis options based on the current context. Take a look to the expanded Analyze menu below. 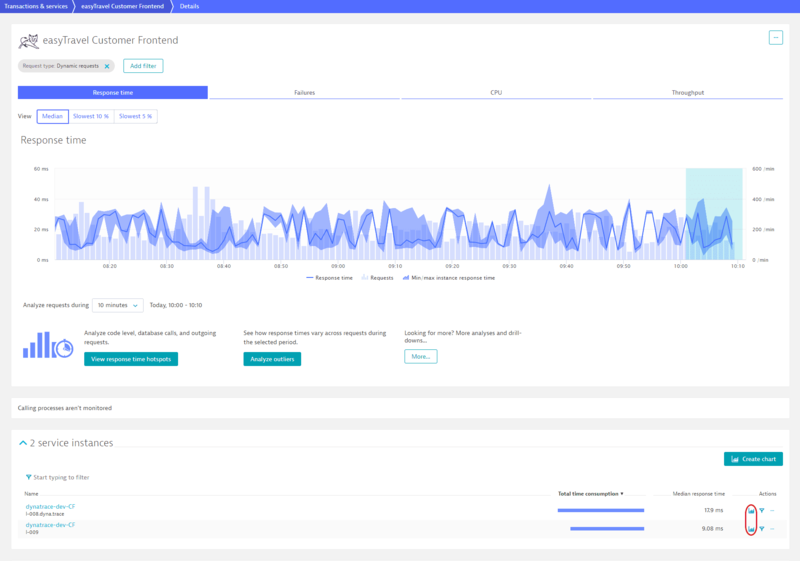 In this example we see options for context-sensitive analysis based on Method hotspots, Outliers, PurePaths, Response time hotspots, Service backtrace, Service comparison, and Service flow. In the example above, we&apos;ve selected the Customer Frontend service in the Incoming requests to this service section and the orange.jsf request in the Requests from section. This drill-down combination focuses analysis on all orange.jsf requests of the Customer Frontend service that call the JourneyService which in turn call the easyTravel-Business database. These filtering selections are carried over to any analysis option you select from the Analyze menu. Context-specific chart creation is available on nearly all service analysis pages that feature table-based layouts. Click any row&apos;s chart button to create a chart based on the contents of the selected row. This simplifies the process of creating charts based on custom metrics or request attributes. For example, if on the Response time tab, clicking the chart button in the Custom Frontend service instance row (which runs on host l-008.dyna.trace) displays a chart that shows response time for this instance of the service. Similarly, clicking the chart button on the CPU tab results in a chart that displays the total CPU time of this instance. The context-specific menu for multi-dimensional analysis charts enables you to perform context-sensitive analysis based on individual time series metrics included in your charts. This menu includes all the filtering functionality that&apos;s available on our service-analysis pages, along with advanced capabilities for charting and splitting based on multiple dimensions. Click any service in the service flow and you&apos;ll now see a hovering drill-down menu. Context-specific PurePaths are available for all non-database services. Click the PurePaths button to view the PurePaths page, filtered to display only those PurePaths that trigger the depicted service flow (easyTravel Customer Frontend in the example below) and subsequently call the selected service (Credit Card in the example below). Context-specific database statements are available for most of database services. 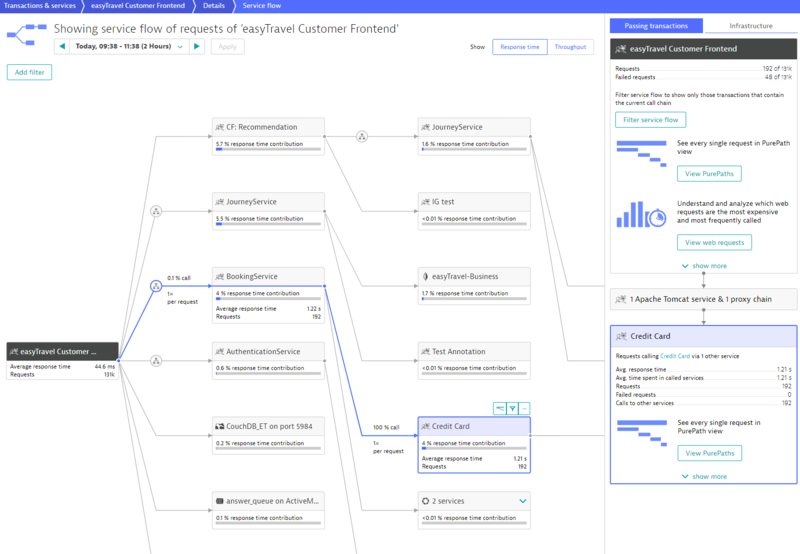 Click the Top database statements button to view the Top database statements page, filtered to display only those statements in database (easyTravel-Business at the picture below) executed by calls, originating in service, that triggered Service flow (easyTravel Customer Frontend at the picture below). Context-specific filters are available for all services. They filter service flow to calls originating in service, that triggered Service flow and subsequently calling the selected service—just like Filter service flow button in the top tile of the side pane. The Analyze menus, available for all services, reveal all possible drill downs and analysis options based on the currently selected service.